Taking a break from their usual interest in dense fantasy worlds and eccentric characters, the illustrious Studio Ghibli brings their imaginative film making resources down to a decidedly smaller realm with their latest offering. "The Secret World of Arrietty" is an adaptation of Mary Norton's "The Borrowers" book series, bringing the furious survival plans of teeny-tiny people to a lush animated landscape, where such whimsical plotting and miniature antics can be represented in an awe-inspiring manner. Crafted with exquisite attention to the tiniest of details and blessedly concise, the feature doesn't possess the epic scope fans might be used to from regal Ghibli offerings, but it retains a lovely spirit of adventure and alliance, forming a modest but sublime picture worthy of the studio. Underneath the floorboards and behind the walls lives a race of diminutive beings known as The Borrowers. Trying to maintain a peaceful existence, Pod (Will Arnett) and Homily (Amy Poehler) look to protect their daughter Arrietty (Bridgit Mendler) from the outside world, teaching her the precise ways of "borrowing" household items from the feared human beings. Endlessly curious and eager to grow up, Arrietty ends up befriending human Sho (David Henrie), a sick boy who delights in the existence of The Borrowers, hearing stories of sightings from his great aunt. Trying to help Arrietty and her family live in greater comfort within the bowels of his house, Sho inadvertently triggers negative attention from housemaid Hara (Carol Burnett), who looks to exterminate the tiny family. The material of this film was always more suited for an animated interpretation, where the marriage of fantasy and adventure can coexist without nifty but iffy special effects constantly trying to depict the contrast between the scavenging Borrowers and the (mostly) clueless humans, who don't immediately suspect four-inch-high people as being responsible for minor food and craft theft. In Studio Ghibli's hands, "The Secret World of Arrietty" is transformed into a tender, open-eyed take on Norton's work, losing overt comic touches to treat the whole endeavor with an appealing sense of wonder. Directed by Hiromasa Yonebayashi (maestro Hayao Miyazaki co-scripts), "The Secret World of Arrietty" doesn't set aside much room for introduction, jumping into the world of The Borrowers midway, introducing the main character as she prepares for her first venture into borrowing with Pod. The mastery of the film is found in the minutiae, with Arrietty's journey utilizing common household items, with hooks and tape turned into mountaineering equipment (for the scaling of tables), while a pin is transformed into a sword. Hunting for tissue paper and sugar cubes, the picture follows the pair as they traverse the foreign land of the humans, dodging rats and crickets along the way. The production treats the customization of tools as a common occurrence, allowing the viewer to make observations of their own, searching the screen for ingenious Borrower inventions. As one might expect from a Ghibli production, "The Secret World of Arrietty" is sumptuously animated, from the miniaturized particulars collected by our heroes to the summertime feel of exteriors, with rain and plant life adding fascinating hazards for the characters. It's a gorgeous film, with a pronounced sound design gifting the action an amazing handle on the magnified Borrower experience, while the melancholy score supports the emotional sway of the picture, emphasizing the unlikely friendship between Arrietty and Sho, also expanding a poignant sense of departure, finding Pod adamant about leaving his home now that his daughter has been exposed to the humans. Arriving now on Blu-ray, the 2-disc combo pack offers a small (no pun intended) amount of extras. Over on disc 1 is the Blu-ray version of the film, which looks and sounds fantastic given the solid production from the studio. Also on that disc are some extras, including: japanese storyboards, 2 music videos, as well as a making-of feature for one of them. On disc 2 is the film as well as similar extras from disc 1. Not much when it comes to what we've seen with other DVD's but the movie itself is the real gem here, so we can over look it. Without attempting to blow audiences away with spectacle, "The Secret World of Arrietty" captures genuine magic from restraint, permitting outsiders to make the same discoveries as Sho, and we fall just as hard for these resourceful little creatures. 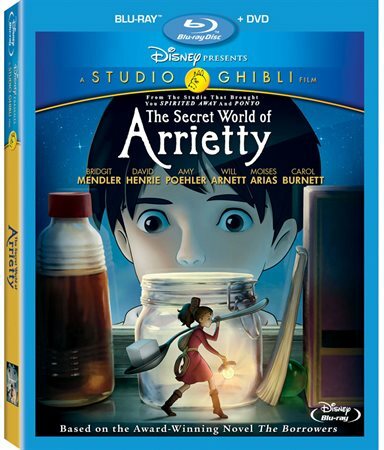 For more information about The Secret World of Arrietty visit the FlickDirect Movie Database.